The Master MISPA is a specific track of master’s degree in Optics, Image, Vision, Multimedia and leads to the award of the French national diploma of Master in Optics, Image, Vision, Multimedia (OIVM). The master programme OIVM is hold by the following institutions which are co-accredited by the french Ministery of Higher Education and Research: University Jean Monnet Saint-Etienne / Faculty of Sciences and Techniques, Ecole Nationale Supérieure de Mines de Saint-Etienne, Institut d’Optique Graduate School and Ecole Centrale de Lyon. 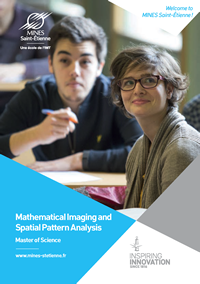 A one-year program taught in English designed to provide the basic and advanced knowledge in Mathematical Image and Geometric Pattern Sciences. Emphasis is placed on the mathematical and computational aspects. A completed first year Master in Mathematics or Computer Sciences. An engineering degree (or a registration in the final year in one French graduate School). File selection and motivational interview. The decision of the admission committee will be communicated to each applicant. The master program is equally open to qualified French and international students with outstanding academic records who can demonstrate their ability to follow courses in both English and French. Image modeling, image processing and image analysis. Color and multispectral image processing. Geometry for spatial pattern modeling and analysis. Project defense in March (report and oral examination). Each M. Sc. Student is supervised by a Professor and an internship scientist. The internship leads to a written M. Sc. Thesis to be defended in September during an oral examination. Rooms and studios at École des Mines de Saint-Étienne student residence on the campus, depending on vacant places. Doctorate in Image and Patten Sciences. Jobs in R&D, engineering, and consulting.